Exercise helps relieve feelings of anxiety and stress and often leaves most people feeling exhilarated and refreshed. Exercise may also cause you to feel hot and sweaty and in slight pain. If you experience a fever and/or aches and pains after a workout, drink plenty of water and take a break. Stretch out achy muscles as well. It is not uncommon to experience a slight rise in body temperature during and after a workout. 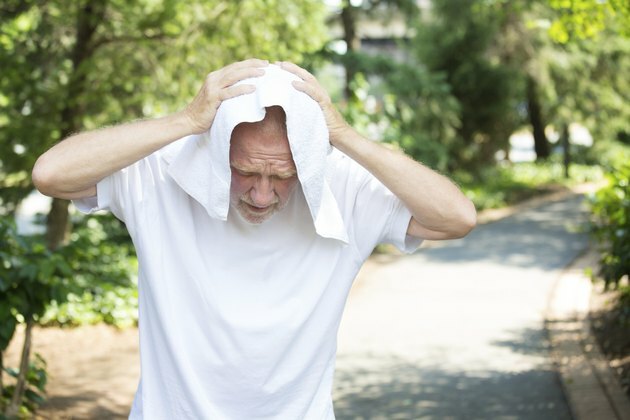 The slight rise in temperature is your body's way of preventing exercise-related illnesses such as heatstroke and protecting vital organs from overheating. This effect may last up to a couple of hours after a workout. Monitor any changes in your body temperature and stop and take a break if you feel too hot. If your temperature reaches between 101 and 104 degrees F, then you may be at risk of overheating. A fever over 104 degrees F may result in loss of consciousness. Do not exercise if you already have a fever. Exercise may cause tiny tears in muscle fibers, which helps build stronger and more flexible muscles. It also may lead to pain and discomfort. Exercise may also cause sprains, strains and other injuries, especially when lacking adequate warm up and cool down time, using equipment incorrectly or when working out too hard or too fast. Spend five to ten minutes warming up your muscles prior to working out. Go for a slow walk or do some jumping jacks. After your workout, perform stretches or go for a swim in a pool. If the pain is still there, try over-the-counter pain relief medicine. If you are new to exercise and fitness, or it has been some time since you last worked out, it is important to start and progress slowly. The Mayo Clinic recommends creating a fitness plan that best matches your physical abilities. Follow all instructions when using fitness equipment and start each workout with warm up exercises. As your fitness level improves, gradually increase the intensity, time and speed of your workout. Take frequent breaks and drink plenty of water. After you exercise, slowly reduce the intensity of your workout. Stretch all muscles. It is also very important to take a day or two of complete rest every week. Fever, aches and pain may be symptoms of a viral infection, like the flu, or other underlying health condition such as fibromyalgia or a possible injury. Continuing to exercise with such symptoms may lead to dehydration, increased risk of injury and possibly death. If symptoms do not change after you have cooled your body down, seek medical attention. How Soon Can I Work Out After Getting Sick?